Climea is a herbal supplement derived mostly from soy beans that is used to relieve menopausal symptoms. Isoflavones – from soybeans enriched with extract of hops. folic acid and vitamin B6 helps in proper functioning of the immune system and contribute to the reduction of tiredness and fatigue. Vitamin E helps protect cells against oxidative stress. flax seed helps reduce appetite by what helps to control weight during menopause. Calcium helps to maintain normal energy metabolism. It helps in the functioning of the muscles and maintain neurotransmission. It also participates in the process of division and specialization of cells and is necessary for maintaining healthy bones and teeth. Vitamin D3 helps in the absorption and utilization of calcium and phosphorus and maintain normal levels of calcium in the blood. Is also involved in the process of cell division, affects the functioning of the immune system and helps maintain healthy bones and teeth. Vitamin B6 contributes to the regulation of hormonal activity and helps in the proper functioning of the nervous system. It contributes to the maintenance of favorable protein and glycogen metabolism and helps in the production of red blood cells. Folate which include folic acid helps in the synthesis of amino acids and in normal blood production.Also affect the maintenance of psychological function. The product is intended for adults only. It is taken orally. 1 tablet once a day. It should not be used for more than 6 months without consulting a physician. 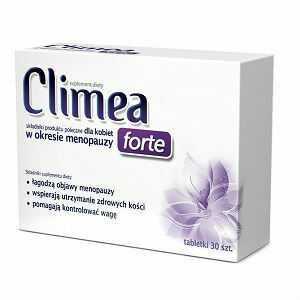 Climea seems to be more of a vitamin and minerals supplement than a drug that is used for relieving menopausal symptoms. Jackie Horowitz	reviewed Climea	on October 26th	 and gave it a rating of 2.